Have you ever wondered, what is the best 'in home gym' equipment you could buy for X amount of dollars (fyi: we use an approximation)? We have you covered. We have created the ultimate resource for picking the exercise equipment (with links to quality products). We have also supplied the exercises and workout plans required to complete your in home workout for the home gym workout equipment mentioned. These levels are great for people just starting to workout at home or need something to tie them over in-between workouts from the gym. This is where you start taking your home workouts seriously and aren't using a home gym just for maintenance. 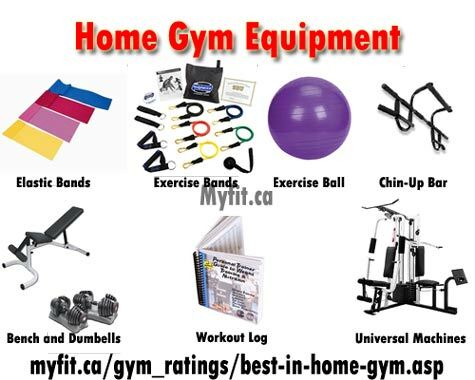 This is for people that NEED to workout at home and want the best equipment out there for their home. This obviously has restrictions but you still can make it work. We have completed a complete list of bodyweight or calisthenic exercises you can perform with things you would find around your home. Also, here is your in home gym workout routine. In our workout routine we have added elastic exercises because elastics cost as little at $5-$15 online and can be a great way to add another demension to your home gym workouts. This is the next step up in the home gym which includes exercise bands. Exercise bands usually have handles which makes it very easy to complete a wide range of exercises. We have a complete list of exercise band exercises to complete. If you dont have an exercise ball you can do these on a chair. Exercise balls are great for just about everything, you can do beginner fitness moves to advanced pikes or abdominal rollouts. Using the elastics as well as exercise bands will allow you to vary up your home workout routine while still keeping the cost down low. We prefer exercise bands to elastics but they also cost about $20-$30 more. This is a step up from the last one being that now you can get exercise bands which have handles and usually come with different clip on tension bands. Exercise bands usually come with a door attachment so you can exercise from the top down instead of always from your feet up. This will give you a wide range of exercises to try. The chin-up bar gives you the ability to do wide lat pull-ups, chin-ups and other more advanced back exercises that are harder to do without equipment. You will notice that most back bodyweight exercises require some sort of chin-up bar to perform them. Dumbbells allow you the freedom to do many exercises working your entire body. Quick release dumbbels are even better with taking up a fraction of the space like a rack uses. This is a great advanced home gym purchase. I would recommend anyone looking to workout at home to get this combination. Universal machines usually allow you to jump from one exercise to the next to complete a circuit training routine. You want to make sure you get one that has a cable attachment, hopefully a leg press and a good vertical press. Other nice to haves are lots of seperate plates. Some home gyms only allow one person to use the 'stack' while others have multiple stacks. If you are looking into treadmills also check out elliptical machines as they provide just as good of a workout but don't have the impact on your knees. They also get your arms involved into the workout. Costs on these range substantially but if there was ever a time to say 'you get what you pay for' this is it. This gym consists of everything needed to get a workout in like at the commercial variety. A universal, elliptical machine, exercise ball, mat, TO bands, quick release dumbbells with a bench and don't forget a workout log to keep up with your progress.